NFLshop is an online store that specializes in the sales of different ranges of NFL jerseys and other wears including T-shirts, sweatshirts, hats, collectables and lots more with NFL team logos printed on them. You can shop on the website for their store which is user-friendly and very easy to operate and navigate as it is built in such a way that even an online novice would quickly find their way around it. There are various shopping options to choose on the online store varying from ‘shop by team’ which allows you to shop for your favorite NFL team jersey or order a complete team kit, ‘gender’ which allows you to choose if you want to order for a male or female NFL jersey, they also have jerseys for kids as well if you’d like to order for your child. They offer a vast selection of NFL gears from the top quality brands, all in one convenient place. They are passionate about their goals of giving NFL fans across the globe access to their favorite team’s gear. This store carries officially licensed products from top brands, provides industry-leading customer service, and provides topnotch shipping service and return policy. They offer a free shipping service for orders of $60 upwards; they ship directly to the address which their customers provide. All orders are treated as a priority as the satisfaction of their customers is of utmost interest to them. Their fan advocates are committed to the satisfaction of NFL fans and their customers as well; they are also shoppers and are dedicated to delivering their customers the kind of shopping experience they would want to have for themselves. Coupled with the excellent service they provide, you could also track your order from their website. 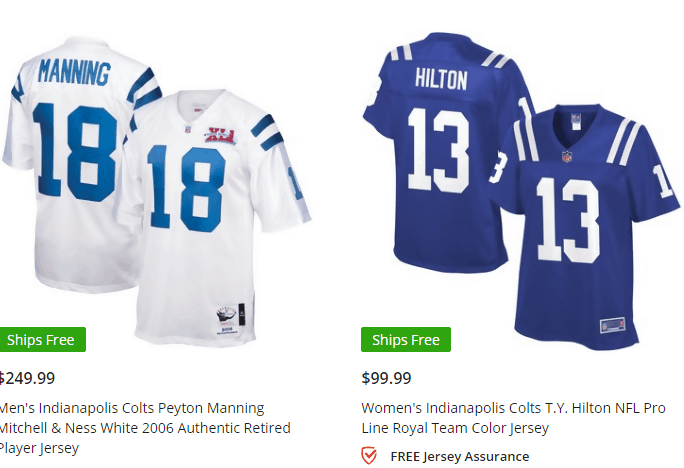 The price of NFL jerseys from them ranges from $30 upwards which depends on the merchandise you decide to order. With a 4.9 of 5 rating received so far from their customers, nflshop is one of the best stores for you to purchase an NFL jersey. Below are some of the feedbacks or reviews given to them by customers that has patronized them once or twice and their experience. Its business, some people would be satisfied and some won’t but they have managed to satisfy more clients, which is a good thing. I ordered my son who was a newborn at the time a newborn size baseball cap of the Dallas Cowboys and I was expected to receive it within two weeks, and I received it within a week, and I was charged a very reasonable amount! I’ve had outstanding experiences in ordering for my son and my husband!—————- Brittany of Newyork. Ordering from NFL.com seems easy enough. They promise shipping dates and even free shipping with a special code. It seemed as if Super Bowl order for my 91-year-old father would not arrive on time. Well, it is here — the day before the Super Bowl and my father is pleased that I got him his favorite NFL team jersey! !————-Jude of Shillington. I placed an order at nflshop.com before reading the reviews. I ordered a Pittsburgh Steelers hat and jersey. The hat was a preorder item, and the website said it would ship out no later than a specific date and the jersey would be shipped with it as well. They shipped out the items on the day they promised. I was able to track the package, and even though I selected standard shipping, I received the order pretty quickly. Everything I ordered arrived perfectly, so I have to say I was very satisfied with my order——— Alecia of Windsor. I was a little worried about ordering from the NFLshop after reading a little negative review which I feel is normal because you can’t satisfy everyone in a business, but I placed an order anyway to give them a shot. I ordered a Raiders jersey Salute to Service about seven days ago and it arrived today. The jersey is exactly what I expected. And I paid for slow shipping, and it arrived very fast in my opinion. Overall I am very happy with NFL Shop and will be ordering from them again in the future——–Ken of Fountain. I ordered a personalized jersey on December 28th online. I chose overnight shipping so it would ship quickly. My brother died on December 27th, and I wanted the personalized Buffalo Bills jersey to bury him in. After I placed the order and paid for overnight shipping. I called the NFL Shop to ensure the jersey would be there before his wake on January 1st. I got a gentleman, and I did not get his name. He told me that there is no such thing as overnight shipping and I should have known that. He said he would call me back and he did; he said he has placed my order on top priority shipping and even refunded the shipping fee which I paid and also gave his condolences. The jersey arrived on the 31st much to my amazement, and I was able to bury my brother in his favorite NFL team jersey——– Latonya of goose creek. NFL shop is the perfect place for you to order the best and perfectly made jerseys; they have all range of jerseys and also have a good review from their customers. All you need to do is go to their website nflshop.com and create an account or not but you will enjoy added incentives if you sign up with them; then you can start making your order and enjoy a stress-free shopping experience. Reading through the feedbacks, you will see some negative reviews but I can vouch for them as they are good at providing their service and business doesn’t go as planned sometimes but they try their best to satisfy their clients.